One of our favorite records of the year, James Elkington’s Wintres Woma is one of subtle nuance, its depth and breadth unfurling with each consecutive listen. 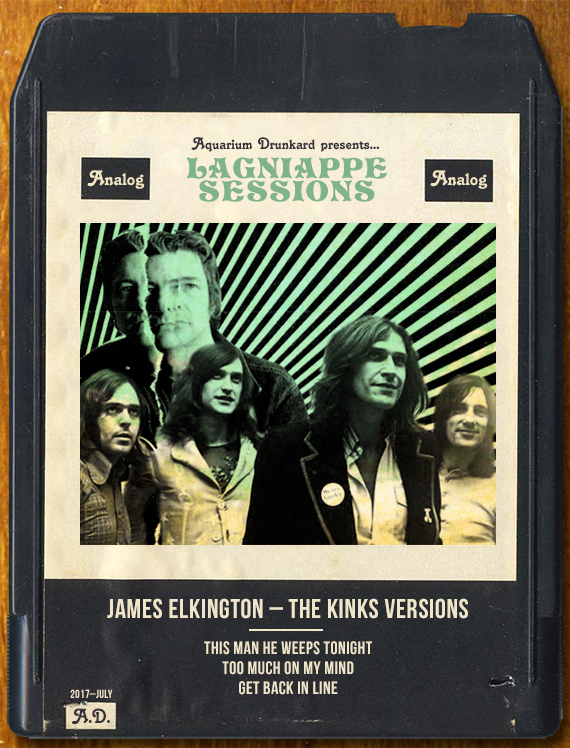 Here, Elkington pays tribute to The Kinks, beginning with a proper nod to the greatness of Dave Davies with 1969’s “This Man He Weeps Tonight”. “Too Much On My Mind”, via the 1966 lp Face To Face, finds a pensive Elkington before culminating with “Get Back In Line”, one of our favorite sleepers off 1970’s Lola Versus Powerman. Elkington in his own words, below. Whenever people ask me if I prefer The Beatles or The Rolling Stones (which they never do), I always say The Kinks (in my mind). Ray Davies’ ability to craft universally-beloved songs from a very terse and individual standpoint is an inspiration to even the most terse individuals among us, and the quality and quantity of great Kinks material from the second half of the 60’s is unreal. This song was originally slated for a Dave Davies solo album, but instead became the B-side to the 1969 single, “Shangri-La”, and dates from a period where they simply could not put a foot wrong. My three year-old can really belt out the chorus when we’re in the car, and he was the one who indicated to me just how good this song is. This is a track from the 1966 album Face To Face: The first band that I wrote songs for was called The Zincs, and as we approached our first show we realized we just didn’t have enough of them. The ‘old-beyond-his-years’ resignation of the lyrics in this song was something I could sympathize with, and the arrangement was simple enough to learn quickly, so we played it, and I feel like its been kicking around the back of my head ever since. I still love it. This was one of Dave Davies’ faves, and comes from 1970’s Lola Versus Powerman And The Moneygoround (Part One). Quite how Ray manages to write a song that is both political and personally emotional without being either overtly earnest or saccharine is a mystery, but I wish more people would figure out how to do it (myself included). I love everything about this song; the tune, the words, the brevity, the organ part, and the fact that the bass-line is always walking down, but not always how you’d expect. This song always spoke to me, but the rest of the album is just as good and worthy of everyone’s attention. And there you have it. I can’t get James’ Kinks tracks to play. We might like to play them on 3WK. use a browser that’s not Chrome.